Black Friday is the day after Thanksgiving. Since Thanksgiving is always on a Thursday, Black Friday is, obviously, always on a Friday. But what’s so special about Black Friday, you may ask? Lots of things! 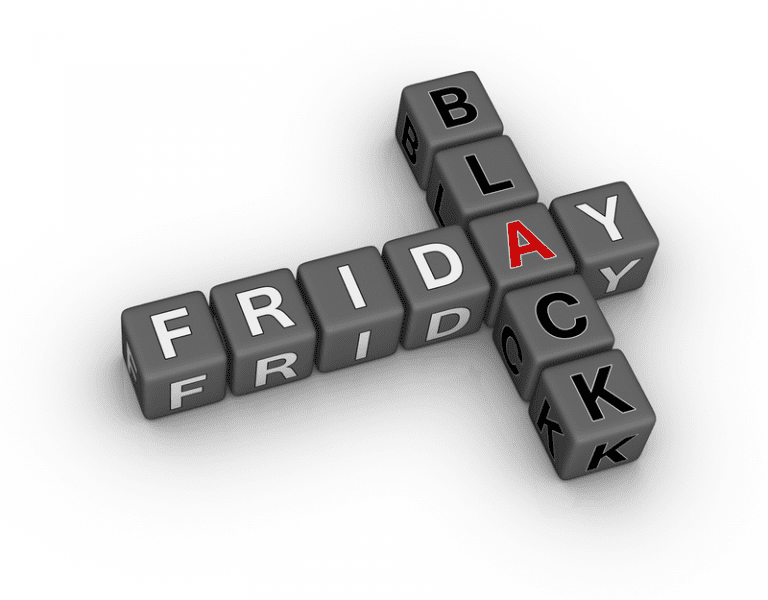 Black Friday is so named because it is traditionally the official beginning of the Christmas shopping season. Since Christmas gift-buying provides a huge annual bump in sales volume for many retailers, many need such massive buying levels to avoid going into the red financially. Thus, Black Friday marks the first day of the year that some retailers actually go into the black, or begin to turn a profit, financially. As shoppers, Black Friday is a great time to snap up some incredible bargains since virtually all stores — online and offline — offer big sales, coupons and other incentives to encourage consumers to buy from them. So, with this great savings opportunity in mind, we offer the following ten tips for getting the best bargains on Black Friday. 1. Create a gift list or “to buy” list. Complicated tasks can usually be completed with less stress when following a plan. With millions of product options available these days, it is easier to know beforehand what one wants to buy than to show up at the store or website bewildered. When gifting, it is very helpful to plan out “the what” and “for whom” side of the equation well in advance so everything can be completed in a timely manner. This also helps in those cases where the desired gift is available only from one retailer – make a note of that detail on your list so you can watch for their next storewide sale and grab those items then. Want a free gift list template? Our Christmas Gift-Buying Checklist (20K .pdf) might work well for you. Before diving into the Black Friday sales frenzy, it is wise to know the product’s normal selling price so you can recognize a really good sale or discount and not just take the retailer’s word that the price is great. Product price comparison tools like PriceGrabber.com can help make this task easier by providing a price baseline to go by. Once you see a product below the price baseline you can jump on it before it sells out. 3. When shopping online, factor in store shipping and return policies. For gifts and items that may need to be returned it is especially helpful to know the shipping and return policies for the retailers selling the products on your list. Some online retailers offer free shipping and don’t charge a restocking fee while others make returns more difficult. Knowing this difference can save a lot of headache and sometimes money later. Also, for heavy, bulky and difficult-to-ship items, be sure to find out if there will be a shipping surcharge associated with them. These facts can help one decide whether it makes more sense to buy the products online or locally. Online shopping is convenient but sometimes costs more when shipping charges are factored into the equation. And sometimes the best prices for a particular item are actually not to be found on the Internet. Traditional store shopping, though, also has “hidden” costs associated with it that online shoppers can avoid. For example, you have to travel to the store and that costs money (think round trip gas costs here). If you have small children and would have to hire a sitter just to go shopping then those costs should be factored into the overall price for buying something at the store or mall. Once all these costs are determined it is easier to accurately compare individual product prices and then decide whether it makes more sense to buy online or offline. 5. Create a shopping strategy and budget. Since Black Friday sales are short and sometimes cover only a few hours or just one day, it is wise to prioritize the order of stores to shop and perhaps even create a timeline or strategy for shopping them. This is true whether shopping online or locally. Traditional stores sometimes have extensive wait times just to get into the store. Likewise, online stores sometimes have so much web traffic that the site runs very slowly and takes longer to load. In some extreme cases, websites can crash from trying to serve too many online shoppers at once. Similarly, it is easy to get into a buying frenzy due to all the huge discounts available and seeing other shoppers loading their carts with lots of exciting products. To avoid overspending, it is wise to follow one’s list closely and stick with the budget outlined in advance. 6. Watch for “early bird” discounts. Many Black Friday sales actually start early, especially online. While local stores are usually closed during Thanksgiving day, online retailers are open for business all the time — that means they often have some great early bird sales on Thanksgiving day. In fact, many online retailers now have special Thanksgiving Sales that only run on Thanksgiving. Likewise, many stores, both online and offline, have special early bird Black Friday sales starting at midnight or very early Friday morning. Be sure to take advantage of them when possible since these items usually sell out quickly. 7. Skip the crowds by shopping locally online. Black Friday can be a stressful mess for traditional shoppers. Lots of traffic, trouble finding parking places, long lines and rude consumers competing for a limited number products are common complaints. One can skip all these hassles by shopping online from home. Another benefit of online shopping is that many online retailers with offline storefronts offer convenient and usually free “ship to store” options that you can take advantage of online. Many also coordinate their online and storefront sales and promotions which means you can get up early (or stay up late) and reserve those Black Friday product specials online and pick them up later at your convenience. In those cases it’s almost like having your cake and eating it too since you get the great Black Friday prices on the products you want without all the Black Friday negatives. Some great Black Friday deals are only available offline in your local store. In those cases, follow your plan and bring the store advertisement page so you can document exactly what the price should be if there are any questions. Remember that you may have to go early to reserve a place in line for the limited inventory. 9. Use a major credit card instead of a debit card. When shopping online, we recommend using a major credit card instead of a debit card since the law tends to slightly favor consumers in the event of a dispute. Also, credit card companies are familiar with resolving disputes in a timely manner. Plus, if you have a points, miles or cash back credit card then you can take advantage of those bonuses. One word of caution about interest though: we don’t recommend overspending and paying interest on products bought on credit. Credit cards only benefit the consumer when paid off in full every cycle. 10. Print and/or keep your receipts. It is a good idea when shopping online to carefully verify your order before submitting. Make sure all charges are clearly identified and all products and options are correct. Don’t forget to verify that the shipping option and fees, if any, are right before approving the order. After you submit your order be sure to either print a copy of the online receipt or save a copy of your email confirmation. Having this information available is essential should an error or dispute arise with your order. If possible, when buying gifts, get a special gift receipt so the recipient can make an exchange later if needed. This same advice applies equally well to local shopping. So there you have our ten tips for getting the best Black Friday bargains! Now get to work scouting out the best Black Friday specials online and offline. Here’s a shameless plug that might help you with your scouting work: shop our coupon and deals page where you’ll find thousands of online coupon codes and promotions for use at both online and local retailers. You can also browse their extensive lists of Black Friday specials (plus those for Cyber Monday just three days after Black Friday). Then you can develop your plan, get your shopping done early, save lots of money and enjoy the rest of the holidays!